First published in 1987 as a modest book of 96 pages, the second enlarged edition has expanded to 176 pages. 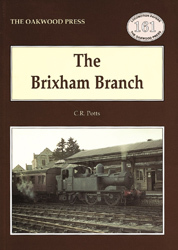 Built and financed by Richard Wolston, a Brixham solicitor, the Torbay & Brixham Railway opened in 1868 and was from the beginning worked by the South Devon Railway which had its headquarters in Plymouth. In 1870 Richard Wolston was declared insolvent, the cost of giving Brixham its railway having broken him financially. After the GWR took over the South Devon Railway in 1876, the T&B became truly independent, but it was a struggle to survive and in 1883 the GWR bought it for a bargain price, far less than it had cost to build. The opening chapters describe the struggle to open the line, its problems with the SDR and its eventual complete independence. Much more has been found out about some of the early workers on the branch. A new chapter details the tremendous difficulties the railway had in obtaining enough water from Newton Abbot after the GWR took over. The GWR years are fully described, with the inclusion of plenty of timetables and plans to enhance the text. Since the first edition, the closure files have been seen, and the events leading up to this sad day in May 1963 can now be described in more detail. A final chapter describes the line and its operations and several more personal memories from those involved with the line are included. Finally eight appendices cover revenue and traffic details, the station masters, the engines shedded between 1902 and 1929 (when the shed closed), amongst other things. A5 format, 176 pages, 116 photographs/plans/maps etc.